Item #07199 Classic U.S.S. Enterprise Ornament $349.95 (ONLY HAVE 1) In Stock This very rare 1991 Classic Enterprise ornament is in a near mint box,has only been taken out of box to make sure all the lights work,lights blink around the main hull of the ship,still has original instruction sheet & original plastic insert to hold the ship,also has the 25th Anniversary logo on the box. Item #05737 Captain Picard Ornament $13.95 ea. In Stock This ornament is in a near mint box & have never been displayed, Captain Picard as he stands in the corridor of the U.S.S. NCC-1701 Enterprise D in his Captains Uniform. Item #01242 Classic Star Trek Phaser Type 1 Keepsake Ornament $18.50 In Stock (ONLY HAVE 1) This 1:1 scale classic Star Trek Phaser Type 1 ornament is mint, never been used, has never been taken out of the box, comes with batteries, has one emitter light and actual dialog from the show, rotate the right activation dial; then press the left activation dial forward to here 3 different settings, press the round button and hear partial phrases from the show. Item #06205 Star Trek First Contact-Locutus of Borg Ornament $28.00 (ONLY HAVE 1) In Stock This Hallmark Keepsake Ornament from Star Trek First Contact- is Locutus of Borg, dated 2005, this ornament has never been used and also connects to a string of lights to hear the dialog between Picard (Locutus) and the Borg Queen as seen in the movie Star Trek First Contact, when the button is pressed it says 4 different phrases from the movie also the eerie lights of the regeneration chamber flashes off and on. Item #07386 Star Trek-TNG Klingon Bird of Prey Ornament Or U.S.S. Voyager Ornament $24.00 ea. 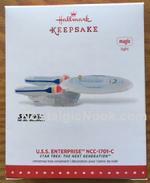 In Stock This Hallmark 1994 Klingon BOP Keepsake ornament or U.S.S. Voyager, back of Voyager box as shown has a crease in the box, but both have never been used only taken out of the box to make sure the lights still work and they all work fine,lights flicker automatically & continuously,complete display instructions inclosed. Item #07331 Classic Star Trek-Shuttlecraft Galileo Ornament $34.95 ea. In Stock (ONLY HAVE 2) This Hallmark keepsake ornament was made in 1992,a fascinating lighted ornament,the shuttlecraft from the classic Star Trek series brings you Mr.Spock`s voice(Leonard Nimoy)wishing you holiday greetings,complete display instructions enclosed,this ornament has never been used only taken out of box to make sure it still works,box is in near mint condition. 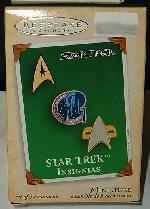 Item #05211 Miniature Star Trek Insignias Ornaments $12.95 ea. In Stock These 2004 miniature Insignia ornaments are mint in a near mint box,never been opened,their are 3 mini ornaments in each set, you get the classic delta shield, Voyager & DS9 communicator badge and also Enterprise Uniform emblem,all are metal. Item #02499 Star Trek The Next Generation U.S.S. Enterprise NCC-1701-C Ship Ornamentt $32.95 In Stock (ONLY HAVE 1) This 2015 officially licensed Star Trek TNG Enterprise C Magic Light keepsake ornament is near mint in an unopened near mint box, as seen in the TV series in 1990 in the episode "Yesterday`s Enterprise" full color is about 5" long, includes 3 batteries, when you press the button, the engines necelles light up.